Moral turpitude convictions (also known as crimes involving moral turpitude (“CIMT“)) and aggravated felonies present serious immigration risks for non-United States citizens. As a Fairfax criminal lawyer, I repeatedly deal with such issues, recognize when I have a sufficient grasp of the issue not to need an immigration lawyer’s advice, and call on a qualified immigration lawyer when my own knowledge base is insufficient. 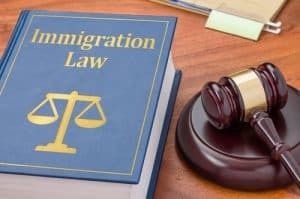 Immigration law and procedure are very complex and ever-changing, based on such factors as statutory law, caselaw, federal regulations, Board of Immigration Appeals decisions, policy changes with each new presidential administration, and discretionary practices of immigration authorities and immigration judges. A lawyer practicing primarily criminal defense needs to recognize when s/he needs to reach out for advice from a qualified immigration lawyer. Posting an inquiry to a criminal lawyers’ email listserv will not usually suffice as a replacement for consulting with an immigration lawyer. The CAIR Coalition’s website is a good starting point for getting a grasp of the complexity of these issues, including this Virginia chart from the coalition. This week, the United States Court of Appeals for the Fourth Circuit issued an opinion confirming the inflexibility in the harshness of the immigration law as to moral turpitude criminal convictions (for which there is a five-year safety net) and aggravated felony convictions, where the petitioner had a prior conviction for marijuana distribution and another for burglary. Guevara-Solórzano v. Sessions, ___ F.3d ___ (4th Cir., May 24, 2018). Whenever a non-United States citizen is charged with a crime, it is important for that criminal defendant’s lawyer to address with the client the risks that a conviction might pose for adjustment of immigration status and applications for other immigration relief, possible deportation, and possible exclusion from the United States. These concerns need to be kept in mind throughout the defense, including dealing with case settlement negotiations, any sentencing, and any decision about whether and how to proceed with an appeal de novo from a Virginia District Court conviction to the Virginia Circuit Court. Fairfax criminal lawyer Jonathan L. Katz for years has included the criminal defense of scores of non-United States citizens, helping them minimize adverse immigration/crimmigration consequences from their criminal cases. Jon will be delighted to discuss your case with you, by a confidential appointment set through his staff.